I find Starbucks’ iPhone gift card app fascinating, but it has some major flaws and what appears to be a misunderstanding of how their consumer behaves. Here are my thoughts, with help from the biggest Starbucks devotee I know, Dan Stratton (@stratta). The app is attractive and except for one item, easy to use. However, refilling the card isn’t intuitive. You tap your balance to do this, but there isn’t anything that indicates this is the case. It is fast, loads quickly and there is rarely any lag in getting it booted up. This means no awkward sessions of making everyone wait in line behind you while you try to pay. It scans fast, every time. Also, there is no lag in it sending the data to a central facility for verification (in fact, I’d speculate they may not be waiting for a response). This, and the step above, are hard to do – so kudos. You get a discount on syrup, or so I am told. I have no idea how this works in practice and no one seems to be able to tell me. Providing an immediate discount for using the card/app is the right thing to do though. Similarly, getting a free drink when you purchase a bag of beans is a nice touch. It takes 30 purchases before your first real reward. That reward is that your app background turns gold and then they mail you a gold card. Of what use is a gold card to a person that has abandoned their card for a mobile app? It takes 45 purchases before your first free coffee. Despite what it says when you sign up, there doesn’t appear to be free “extra” gifts for members. Perhaps a Gold Member could get extra content like song downloads? Why can’t each week’s iTunes download PIN just be sent to Gold Members, instead of making us try to find the cards in-store? “Stars” are earned for each transaction and not each drink purchased. If you purchase two coffees each morning (one for you and one for a coworker who returns the favour in the afternoon), you still only get one “star”. Staff always reach for the phone to scan it. People don’t like to give their phones to anyone – they are personal devices. Scanners should be placed in such a way that the customer can wave their own phone. Starbucks’ scanners are very good (at least the ones I’ve used), so a quick phone wave by a customer, even a clumsy one, would still work. You cannot (or at least could not when I got mine) just download the app and start. You need to go to Starbucks and get a physical card, then input the card data in the app. I am committed to using mobile, stop making me get extra paper/plastic. Also, I know from experience that those little cards are expensive to manufacture. Why not save money on them? It is a rewards app on a phone and I (and everyone else) expect immediate gratification. 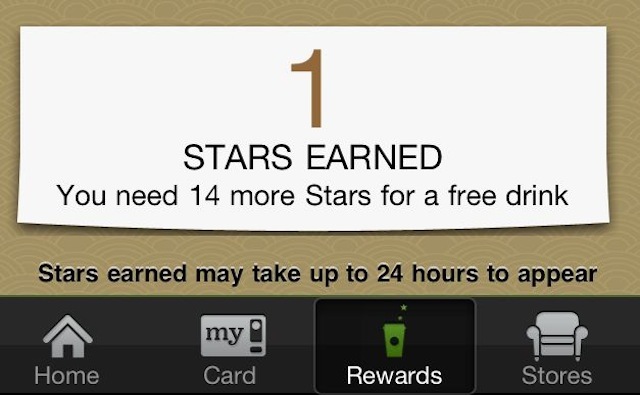 The fact that “stars” building towards free coffee may take up to 24 hours to appear is ridiculous. I should note that Dan Stratton disagrees with me on this, in his experience, “stars” show up more than quickly enough. That’s right, Starbucks developed a mobile gift card and rewards app that doesn’t generate rewards digitally – they mail them to you. From a technological standpoint, they could make that coupon appear the minute that you make your purchase (or I suppose under their system 24 hours later). My suspicion is that this is an Accounting, Security or Provider issue. Basically someone, somewhere said you can do this, but our stores and franchises need a piece of paper to prove they gave away a coffee before we reimburse them. Or Starbucks uses a 3rd party to fulfill their loyalty program and can’t deliver the rewards on their own, in-app. Thus Starbucks has to mail-out these coupons (at great expense); making the mobile customer, used to instant service, wait on a piece of paper in the mail. Starbucks has a great program called My Starbucks Idea. We’re not the only ones with suggestions for improvements – check out others here. Also, if you are interested in coffee, football and the mobile world, follow @stratta on Twitter. Comments? I’d love to get your feedback below.